I was in Tampa over the weekend visiting family and found some "local" fish to cook. Local meaning that it was actually from Florida, in this case, Key West. 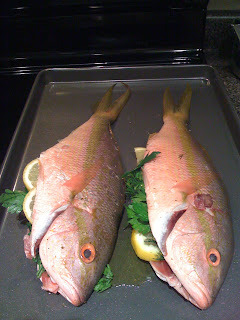 The Yellowtail Snapper looked fresh and glistening in the store and tasted delicious when cooked. I just kept it simple: olive oil, salt, pepper, fresh dill, fresh parsley, lemon slices. Cooked in the oven at 425 degrees on a roasting pan for about 30 minutes, the skin crisps up and the flesh is moist and tasty. It is such a beautiful fish, both raw and cooked.